Background: Bidirectional ventricular tachycardia is a rare form of ventricular arrhythmia, characterized by a changing of the mean QRS axis of 180 degrees. Digitalis toxicity is the most common cause of bidirectional ventricular tachycardia; other causes include myocarditis, aconite toxicity, metastatic cardiac tumor, myocardial infarction, and cardiac channelopathies. Case Report: A 73-year-old male with hypertension and a pacemaker implanted for sick sinus syndrome presented with a complaint of substernal chest pressure for several days. He also stated he had had an episode of near syncope. The patient's physical examination was unremarkable; however, electrocardiogram demonstrated sustained bidirectional ventricular tachycardia. Echocardiogram showed severe anterior wall hypokinesis and an estimated ejection fraction of 35%, as well as an apical ventricular aneurysm. Electrophysiology study showed that the apical ventricular aneurysm was the site of the bidirectional arrhythmia. The patient was successfully treated with ventricular tachycardia ablation. Conclusion: This case is a unique example of a patient with bidirectional ventricular tachycardia originating from an apical left ventricular aneurysm that was treated successfully by ablation. 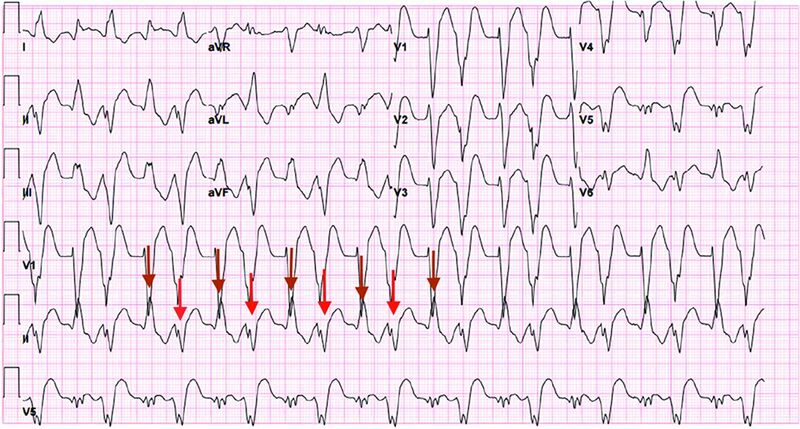 Bidirectional ventricular tachycardia is a rare form of polymorphic ventricular tachycardia, characterized by beat-to-beat alternation of the QRS axis of 180 degrees. The rate is typically 140-180 bpm. The most common cause of bidirectional ventricular tachycardia is digitalis toxicity.1 Other etiologies include myocarditis, aconite toxicity, long QT syndrome type 7,2 metastatic cardiac tumor, acute cardiac allograft rejection, and myocardial infarction.3 We report a case of bidirectional ventricular tachycardia emanating from a left ventricular aneurysm. A 73-year-old male with a medical history significant for hypertension and a permanent pacemaker for sick sinus syndrome was admitted to the hospital with a complaint of several days of substernal chest pressure and an episode of near syncope. Except for his heart rate, the patient's vital signs were stable, with no evidence of hemodynamic instability. Physical examination was unremarkable. Laboratory studies did not reveal any significant abnormality. Electrocardiogram performed in the emergency department demonstrated sustained bidirectional ventricular tachycardia (Figure 1). Treatment with a 150 mg intravenous bolus of amiodarone followed by a constant infusion resulted in a return to normal sinus rhythm within 6 hours. Echocardiogram revealed severe anterior wall hypokinesis with an estimated ejection fraction of 35% and an apical ventricular aneurysm (Figure 2). Cardiac angiography demonstrated severe stenosis in the proximal left anterior descending, left circumflex, and proximal right coronary arteries. Based on the patient's anatomy, multiple comorbidities, and high surgical risk, he was deemed a poor candidate for either percutaneous coronary intervention or bypass surgery. His hospitalization was complicated by recurrent runs of sustained bidirectional ventricular tachycardia. Electrophysiology study showed that the apical ventricular aneurysm was the source of the bidirectional arrhythmia. Based on the findings, ventricular tachycardia ablation was performed successfully. The patient was discharged home on amiodarone 200 mg twice daily and carvedilol 25 mg once daily. When the patient was evaluated at 6 months, pacemaker interrogation did not reveal a recurrence of sustained ventricular tachycardia. Figure 1. Bidirectional ventricular tachycardia. Note the alternating QRS axes and bundle branch block morphology. Figure 2. 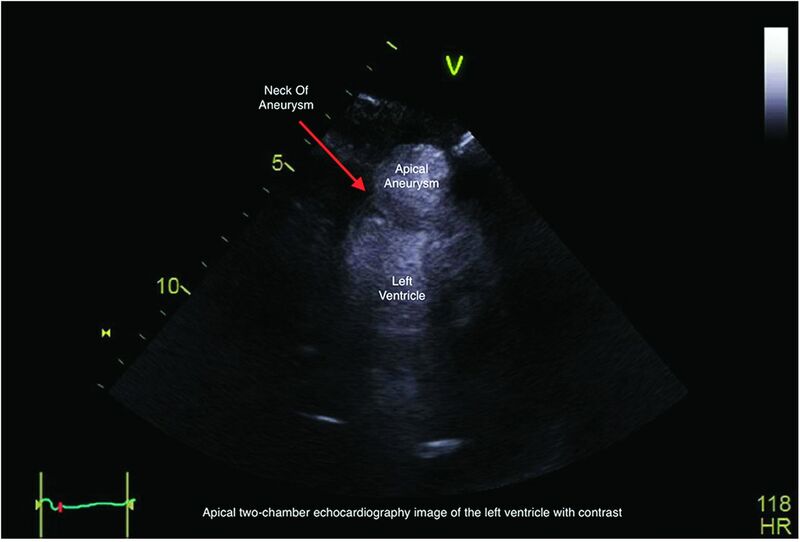 Transthoracic 2-dimensional echocardiogram with contrast showing apical left ventricular aneurysm. Bidirectional ventricular tachycardia can be associated with catecholaminergic polymorphic ventricular tachycardia, also known as familial polymorphic ventricular tachycardia, a syndrome resulting from inherited abnormalities of myocardial cell calcium channels.7 Believed to be caused by RyR2 and CASQ2 gene mutations, catecholaminergic polymorphic ventricular tachycardia is usually diagnosed in the pediatric population and tends to occur under adrenergic stimulation (eg, during exercise or stress).8 Moreover, torsades de pointes can occur with congenital or acquired long QT syndrome9 and should be considered in the differential diagnosis of polymorphic ventricular arrhythmia. In the absence of inherited myocardial channelopathies, bidirectional ventricular tachycardia has long been associated with digitalis toxicity. Although the exact mechanism of bidirectional ventricular tachycardia is unclear, evidence from human and animal electrophysiologic studies has shown that alternating ectopic foci originating from the distal His-Purkinje system in either or both ventricles may be the cause of the arrhythmia.10 The mechanism is thought to be secondary to delayed after-depolarization in phase 4 of the myocyte action potential. Patients who present with this arrhythmia should be evaluated for drug toxicity, metabolic derangements, and potential genetic etiologies. Furthermore, based on this case, investigation should also include consideration of potential alterations in ventricular architecture. We present a rare case of bidirectional ventricular tachycardia originating from an apical left ventricular aneurysm that was treated successfully by ablation.
. Ventricular tachycardia as a result of the administration of digitalis. Heart (Br Card Soc). 1922;9:199.
. Calcium channel blocker and adenosine triphosphate terminate bidirectional ventricular tachycardia in a patient with Andersen-Tawil syndrome. Heart Rhythm. 2008 Mar;5(8):498-499. doi: 10.1016/j.hrthm.2007.12.012.
. Type II bidirectional ventricular tachycardia in a patient with myocardial infarction. J Electrocardiol. 2009 Nov-Dec;42(6):631-632. doi: 10.1016/j.jelectrocard.2009.06.011.
. Transient left ventricular aneurysm and hypertrophy accompanied by polymorphic ventricular tachycardia in a patient suspected of acute myocarditis. Jpn Heart J. 2000 Jan;41(1):97-102.
. Bidirectional ventricular tachycardia with myocardial infarction: a case report with insight on mechanism and treatment. Indian Heart J. 2014 Jul-Aug;66(4):466-469. doi: 10.1016/j.ihj.2014.05.024.
. Bidirectional ventricular tachycardia in cardiac sarcoidosis. J Arrhythm. 2017 Feb;33(1):69-72. doi: 10.1016/j.joa.2016.05.003. Catecholaminergic polymorphic ventricular tachycardia in children: analysis of therapeutic strategies and outcomes from an international multicenter registry. Circ Arrhythm Electrophysiol. 2015 Jun;8(3):633-642. doi: 10.1161/CIRCEP.114.002217.
. Catecholaminergic polymorphic ventricular tachycardia: recent mechanistic insights. Cardiovasc Res. 2005 Aug;67(3):379-387.
. Drug induced QT prolongation and torsades de pointes. Heart. 2003 Nov;89(11):1363-1372.
. Bidirectional ventricular tachycardia: ping pong in the His-Purkinje system. Heart Rhythm. 2011 Apr;8(4):599-605. doi: 10.1016/j.hrthm.2010.11.038.